Students from Stanbridge College’s Master of Science in Occupational Therapy Program were invited to present their groundbreaking research regarding the future of long-duration space exploration at the 100 Year Starship Symposium in Silicon Valley, CA. 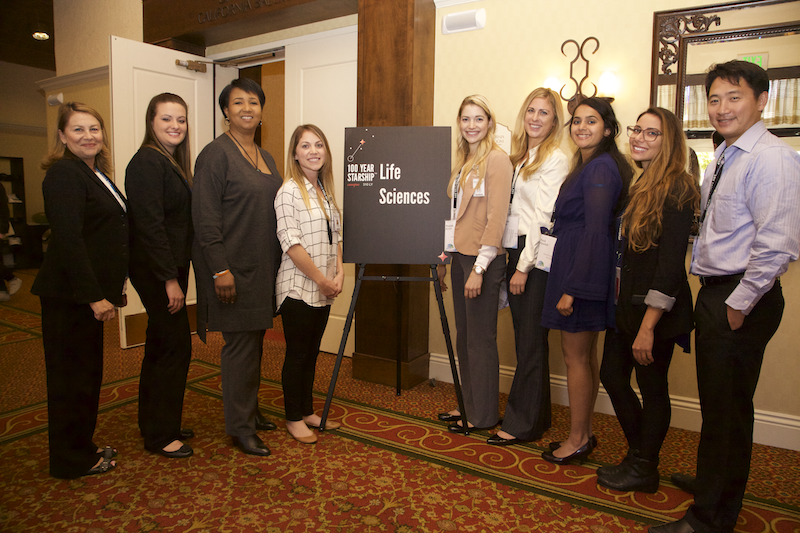 Dr. Mae Carol Jemison – NASA astronaut and the first African American woman to travel in space – joined Stanbridge College MSOT Program Director Dr. Janis Davis, and graduate students to celebrate the 100 Year Starship Symposium. Graduate students Macy Burr, Howard Koh, Rochelle Telles, and Maria Absi presented their research, “The Contributions of Occupational Science to the Readiness of Long Duration Space Exploration,” which examines how occupational science, through occupational therapy intervention, can identify strategies that minimize disruptions in task performance for the astronauts. Their research, in conjunction with Fordham University and the Interdisciplinary Collaborative on Health, Environment, and Human Performance, will offer insight to challenges astronauts encounter while living in space, and offer occupational therapy based interventions to promote wellness for life during their travels. By examining the eight types of occupation (activities of daily living, instrumental activities of daily living, rest and sleep, play, leisure, education, and social participation), Occupational Therapists can minimize the physically and emotionally ravaging effects of deep space travel, and optimize performance. The 100 Year Starship is an endeavor led by Dr. Mae Jemison, physician, engineer, educator and entrepreneur, who was the first woman of color to go into space aboard the Space Shuttle Endeavour and was a NASA astronaut for six years. The mission of The 100 Year Starship is to promote the research and development of breakthrough technologies to advance the goal of interstellar space travel within the next 100 years. “The 100 Year Starship Symposium was a unique experience for our Stanbridge MSOT students. They presented their thesis work alongside engineers, mathematicians and astrophysicists and got to meet and mingle with people who are helping our country explore space in part, to improve life on Earth,” said Dr. Janis Davis, Ph.D., OTR/L, and MSOT Program Director. The theme of this year’s symposium was “Finding Earth 2.0” and focused on the search for a planet capable of supporting Earth-evolved life. Finding an “Earth 2.0” would have enormous implications for advancements in technology, knowledge, and the human experience.